I was serious about taking a break from sewing. I did not sew one thing this week. Whenever a project started creeping in my head, I instantly pushed it out. I even said no to a custom order request that I received. I was a little nervous about it, but after I did it I felt so liberated. I really didn't want to do it, so I finally realized I just need to say no. I know it might sound silly, but saying no is VERY hard for me. I am starting to feel small twinges of desire to sew, so I am sure I will be back at it soon. 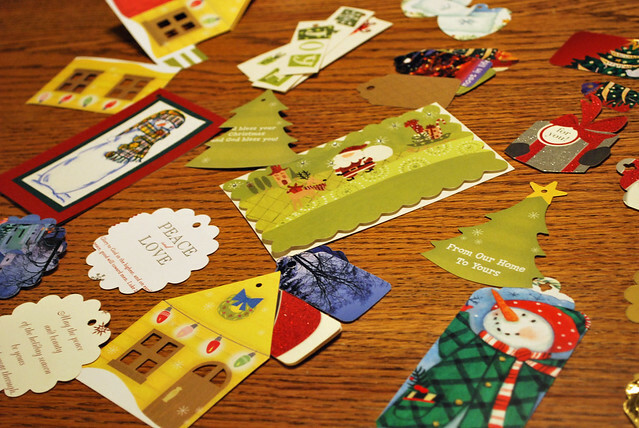 The only crafty thing I have to show today is some tags I made from Christmas cards that we received this year. Initially, I was going to just save them for next year. Then I decided to go ahead and do them now. Who knows if I will remember that I set the cards aside? A year is a long time, you know? I used my Sizzix Big Shot for some of the tags, which I have had for over a year now and LOVE. It will cut fabric, felt, paper, and even aluminum cans. It is a very cool tool. Some of the cards I just used regular old scissors. Now I have tags all ready for next year. Talk about planning ahead. I have a guest post up today over at Ladybug Blessings so make sure to check it out. You are on the ball and have a head start for next year! GO JEN! And congrats on embracing the power of the word NO! Those are really cute and yay keep saying No! That is a cool machine, I've seen them but never really considered getting one. Do you think it would cut thru a cereal box? Such a great idea. I have all my cards still sitting on the table- I felt bad about throwing them away. Well now I can put them to good use. It sounds funny already planning for Christmas THIS YEAR, but I am there with you too. There are so many things I never got around to last year and starting now will help w/not putting them off again. It's very liberating to say no. Believe it or not, I can say it to others, but I have a hard time saying it to me when I want to take on just one more project.